This chili is SO scrumptious, and has a great kick from the adobo sauce (which comes from a can of chipotle peppers in adobo sauce! ), and has a beautiful red color. Be prepared to scarf down your bowl, and quickly be back for seconds. 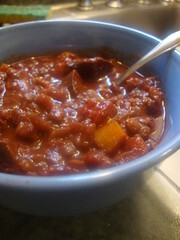 I chopped all of my vegetables into large pieces – I like a rustic, chunky chili. Cut your vegetables however you like. Heat olive oil in a large pot. Once heated, add onion, garlic, and jalepeno and cook for a few minutes, just until the flavors have a chance to combine. Add carrots and beets and sitr; cook for about five minutes. Add tomatoes (both canned and fresh), lentils, salsa, and spices and cook for another five minutes, so the spices have a chance to combine. Add water and stir. Cover with a lid and cook for about 40 minutes over medium-high heat. You want the lentils and veggies to be tender. Scoop some into a bowl and enjoy! Serves approximately 6 people. What do you think about beets? Like them? Hate them? Why? I love beets! They have such an earthy flavor (if that makes any sense). I think I'm going to try growing some in the garden this year, then I'm going to try out this chili. Your recipe is different from any I've seen, so I'm excited to try it out! Were your lentils cooked ahead of time? nope! I just used them straight from the bag!